Abstract: The Eric and Jason Coker Collection contains clippings, correspondence, photographs, and other materials related to Eric and Jason Coker, twin brothers studying abroad through Syracuse University's Division of International Programs Abroad (DIPA) and killed in the bombing of Pan Am Flight 103. Eric and Jason Coker, twin brothers from Mendham, New Jersey, were born on April 23, 1968. They were traveling home from London after completing a semester abroad with Syracuse University's Division of International Programs Abroad (DIPA) when they were killed in the bombing of Pan Am Flight 103. Eric was a junior majoring in economics at the University of Rochester. He was a member of the Newman Club, the Meridian Club, and the Economics Council Organization. Eric also helped plan many university ski trips. Jason was a junior at the Newhouse School of Syracuse University, majoring in communications. Jason was a member of the Daily Orange staff and was co-founder of World Watch, an international current affairs club. Eric and Jason were survived by their parents, Thomas Coker and Barbara Primeau; their stepmother, Dorothy Coker; their stepbrothers, Bruce, Scott and Brian Norwell; their sister, Julie Norwell; and their half-brothers, Tom and Scott Bauer. 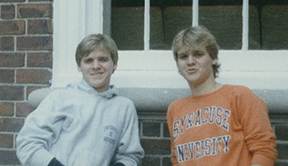 The Eric and Jason Coker Collection contains clippings, correspondence, photographs, and other materials related to Eric and Jason Coker, twin brothers studying abroad through Syracuse University's Division of International Programs Abroad (DIPA) and killed in the bombing of Pan Am Flight 103. This collection is separated into nine series. The Clippings series contains newspaper articles regarding the bombing of Pan Am Flight 103 as well as clippings about the people whose lives were lost. Correspondence contains the letters and notes from Eric and Jason, as well as their mother Barbara Primeau. The Eric and Jason Coker series contains photographs the twins took, and their written works from college and high school. The Funeral for Eric and Jason Coker series contains materials surrounding their funeral. Mass Cards contains all of the Mass cards given in memory of Eric and Jason Coker. Memorials includes any memorial that was placed or held in memory of Eric and Jason Coker, or in memory of the Pam Am Flight 103. Victims Groups series contains information from the Victims of Pan Am Flight 103, Inc., and trial information. The Lauren O'Donnell Donation contains photographs from the fall of 1988, some of which include Eric and Jason Coker. The Michael Toole Donation includes photographs, clippings, correspondence and other materials related to Eric and Jason Coker. Materials in the Eric and Jason Coker Collection were donated by Barbara Primeau, Mike Toole, and Lauren O'Donnell between 2007 and 2013. This collection has been fully processed and placed in archival boxes and folders in alphabetical order by folder title. This collection was divided into series and placed in alphabetical order. Donations by Michael Toole and Lauren O'Donnell were placed after those from Barbara Primeau.